Opus celebrates the best from the British Isles with its market fresh and seasonal emphasis on produce. The daily changing menu is ingredient-led, reflecting what is purchased at the markets each morning. Love food. Do you work at Opus Restaurant? What did you think of Opus Restaurant? The food here is delicious. I always take my work friends here for their monthly meeting. Fab service and nice up-beat atmosphere. 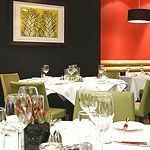 Opus, situated in the business district of central Birmingham, is a stylish, modern restaurant with super efficient, friendly staff serving exceptional food. Opus is located on Cornwall Street, a quiet area, away from the hustle and bustle of city centre traffic. On entering diners find themselves in a dramatic open space of calming colours. This is the main dining area with tables comfortably spaced to provide you with just enough privacy. The relaxing bar is separated from the main area at the far end of the restaurant. Opus is always full and it is wise to book well ahead. This is a top spot for business lunches and, in the evening, an ideal venue for a romantic dinner or meeting friends for any celebratory occasion. Opus has been voted one of Birmingham's best restaurants and if you're lucky you might spot a famous chef enjoying a night off. Opus also provides private rooms which cater for up to sixty people. Diners are immediately greeted by staff with a friendly welcome and are directed to the bar where they can enjoy a relaxing drink and a dish of fine olives. There is an extensive wine list but the house wine is very pleasant at £12.95 and cocktails are around £5.50. Staff are only too happy to answer any queries concerning the menu or the wines on offer and they appear to be very knowledgeable. If you dine at Opus you will be spoilt for choice. The Opus team pride themselves on offering the best seasonal British food, letting the quality of the raw ingredients shine through. Their dishes are simple but creative. They claim to change their menu twice daily to reflect what is fresh at the markets. If fish is your favourite you'll be delighted with the variety and quality offered - from Cornish crab, lobster, Brixham lemon sole to oysters served on a bed of ice. A variety of superb starters head the menu - the lobster and pink grapefruit salad is refreshingly tasty. From the mains, the beef is exceptional served with morel sauce or the Cornish lamb fillets are to die for. Their signature dish is seared Lyme Bay scallops and belly of pork with spring onion mousseline and puy lentil and leek sauce - you must try this, it's exceptional. Opus are known for their delicious desserts. You won't be able to resist the rhubarb and apple crunch Martini yoghurt sorbet, which just melts in your mouth. Starters, mains and desserts are all impeccably presented – they almost look too good to eat. A set menu is available Mon - Fri at £17.50 for 2 courses and £19.50 for 3. The a la carte menu prices are between £6-£12 for starters, £13-£20 mains and £6 for desserts. Highly recommended for superbly cooked British food - treat yourself. 11 destinations curated by View .